With a documented history stretching back a thousand years, Dunster Castle on the Somerset coast is one of Britain’s oldest and most intriguing great buildings, its turrets evoking centuries of siege warfare, dark deeds, bloodshed and treachery. 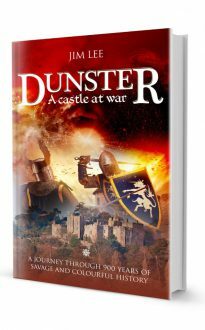 Dunster’s rich and colourful story covers more than nine hundred years of intermittent warfare. Only two families have owned and occupied the castle, from the Norman Conquest in 1066 which led to its construction right through to the 20th century; the second of these remained in charge for 21 generations and six hundred years. These families and their knights, some worthy of their shining armour, others less honourable, brought peace and warfare, treachery and glory to the castle in equal measure down the years. Author Jim Lee worked full time for the National Trust at Dunster Castle for 20 years. Few people are better qualified to tell its extraordinary story.